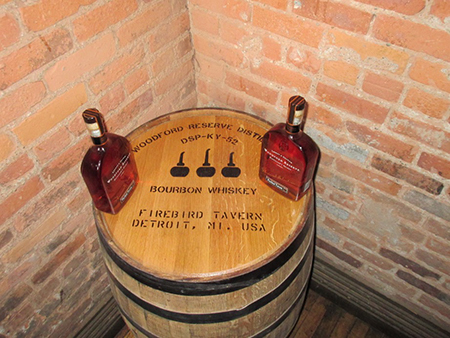 Firebird Tavern, located in the heart of Detroit’s historic Greektown entertainment district, will roll out a barrel of its own “Personal Selection” of Woodford Reserve Bourbon in celebration of its second anniversary. Firebird Tavern co-owners, Owen Burke and Tony Piraino, traveled to Kentucky’s Woodford Reserve distillery on a mission to make their ideal blend of Woodford Reserve bourbon to share with their bourbon-crazed customers. Among only three establishments in Michigan to have the chance to work with Master Distiller Chris Morris (only the seventh in Brown-Forman Corp.’s 140-year history) this year, Burke and Piraino were guided through Woodford’s award-winning process. Piraino says Woodford Reserve isn’t manufactured; it’s crafted in small batches. The artisanal process allows the distiller to craft using all five sources of bourbon flavor, giving it its distinct taste and crisp, clean finish. For example, each sip of its Distiller’s Select craft bourbon contains more than 200 congeners, natural color, aroma and flavor components. “We are busier than I ever could have imagined,” says Chris Morris, master distiller at Brown-Forman Corp., producer of Woodford Reserve and Old Forester bourbons. In 2013, Kentucky distilleries filled 1.2 million barrels of bourbon — the most since 1970, according to the Kentucky Distillers’ Association. Inventory has topped 5 million barrels for the first time since 1977. Production has surged by more than 150 percent in the past 15 years in Kentucky — home to 95 percent of the world’s bourbon production. Firebird Tavern will host a private VIP tasting on its second floor from 6-9 p.m. Aug. 29, opening the event – and its barrel – to the public after 9 p.m. Guests can enjoy live entertainment, food, drink specials and more in celebration of the tavern’s second anniversary. The main floor bar and dining area will be open as usual, from 2 p.m. to 2 a.m.
For more information about Firebird Tavern, visit firebirdtavern.com.